When it comes to solar panels, prices vary considerably. However, when it comes to residential rooftop solar panels, prices are fairly easy to quote. But taking another 180-degree U-turn on this, there’s one more “however” to throw in there — when it comes to putting solar panels on your roof, you won’t find a set global or even national price that is likely to fit for your situation. First of all, solar panels are a bit like cell phones — there are many different types that are made of different things and vary considerably in “quality.” These different types of solar panels also have varied costs. For a much more detailed run-down, check out our post on the most efficient solar panels. The bottom line is, different applications require different types of solar panels. NASA needs high-efficiency solar panels that don’t take up as much space, even they are most costly. (Think real estate in NYC is expensive? Consider how precious and expensive real estate on a satellite or rocket is.) Campers who want a clean, portable source of energy for their cell phones or such do better with lightweight and flexible solar panels, even if they are a bit less efficient and cost more per watt-hour of electricity. More likely than not, however, you are looking for solar panels for your home or business. Am I right? In such applications, the prices are obsessively tracked and are quite easy to find. In Q1 of this year, the average cost of solar panels was $0.65/watt, according to U.S. Solar Energy Industries Association (SEIA) and GTM Research. In Q2 of this year, REC Solar reports that the price was $0.73/watt. On July 31, PVinsights, a global solar PV research firm, reported that the average price of silicon solar panels was $0.69/watt, with a range from $0.55/watt to $0.99/watt (even within this segment of the market, there is some variation in efficiency/quality and, thus, price). But the fact is, most of us aren’t going to buy solar panels directly. Most of us are going to buy the installation of solar panels on our roof by a certified professional. That side of things swings the panel back in the direction of wide variation in prices. For various reasons, the price of installed solar panels is very different in different locations. Different labor rates, different permitting requirements and costs, different levels of market competition and maturity, and different solar incentives are some of the key factors that end up making the average price of residential solar panels less than $3.00 per watt in some places in the US and almost $8.00 per watt in other places. 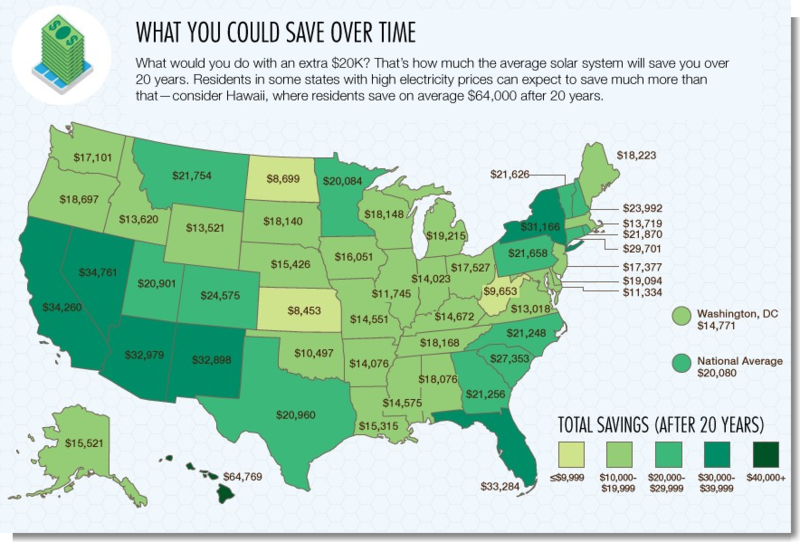 To actually find out what it would cost to go solar in your area, you need to get connected to local or regional solar installers. You need to get a quote or two. We can help you with that — we can hook you up with a solar panel installer in your area. Simply enter a few pieces of information on our homepage and we’ll get rolling. Before I leave you to go do that, I’ll just add a few important notes that you may be overlooking. Most of you can now get a $0-down or little-money-down loan from the bank or a $0-down or little-money-down solar panel lease, which means that you don’t need to consider the price of the solar panels alone. What you need to consider is the long-term savings. In every state in the country, people are saving thousands or tens of thousands of dollars from rooftop solar panels. In other words, if you have a roof that doesn’t have serious issues, you would very likely save a ton of money by going solar, and you would be throwing away thousands or tens of thousands of dollars by not going solar. The decision is really that obvious. But, anyway, to find out how much solar panels would cost for you, how much you’d likely save each month from going solar, and how much you’d likely save over several years, just answer the short questions on our homepage. We’ll shoot you over some initial projections immediately, and we’ll follow that up by connecting you with a solar panel installer (or more) in your area who can give you quotes on installed solar panel prices.